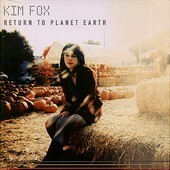 On her second full-length, Return To Planet Earth, Kim Fox follows up her Dreamworks record, Moon Hut, with thirteen songs that range from radio-friendly pop-rock to completely introspective acoustic pop, stripped away of any gloss or production values. However, no matter what platform she's in, Kim Fox's strong vocal deliver, it's slyly little-girl tone making her grown-up lyrics sound even more profound, always makes the songs moving. She also writes one heck of a hook, too. I'll give it a B.